Doors open at 1:30 PM with service beginning at 2:00 PM. Our congregation is comprised of men, women, children and elders from diverse cultural, ethnic, spiritual, and economic backgrounds. We come together in Gaia's Temple to share the inclusive joyfulness and refreshing perspective that the teachings of Goddess worship offer. Anyone with a healthy respect for the Earth and all Her creatures will find a place to belong in Gaia's Temple. Hope to see you in Gaia’s Temple! Services are held on the second Sunday of every month. Doors open at 1:30 PM for the 2:00 - 3:15 PM service. An inclusive Ministry, Gaia's Temple fosters love of the Divine Feminine by honoring nature and the qualities of compassion and relatedness. Our vision is to create balance in the world through the worship of the Divine Feminine. Our values: Respect, Love, Peace, and Integrity. 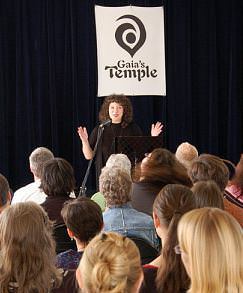 Gaia’s Temple is a 501(c)(3) non-profit organization. Your generous donations are tax deductible. 2005 - 2019 © Gaia's Temple ~ All Rights Reserved.